A four bedroom terraced house which is located in a cul-de-sac in the popular town of Bruton. The property benefits from gas central heating, double glazing and a garage in a block. In brief, the accommodation comprises, entrance hallway with cloakroom, kitchen, a good sized lounge diner, 3 bedrooms and bathroom to the first floor, and a spacious master bedroom with en suite and eaves storage located on the second floor. 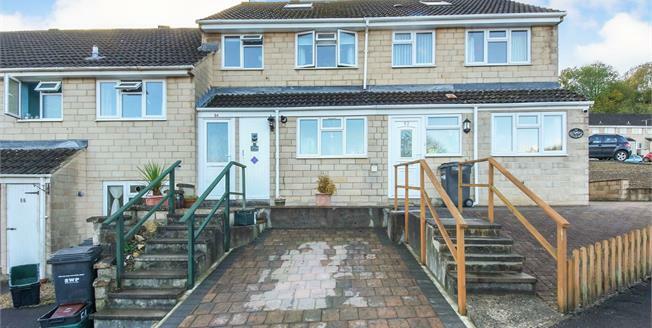 There is a paved driveway providing parking for one vehicle to the front and a tiered, sunny aspect rear garden. This property is offered for sale with no forward chain. Paved driveway with space for one vehicle, step up to outside storage cupboard and front door. Also with single garage with parking space in front. Entered via part glazed, UPVC front door, with a radiator and doors to the kitchen, living room and WC respectively. Tiled throughout, with low level WC and white ceramic wash hand basin. With a range of base and wall mounted units with work surfaces over. Stainless steel sink and drainer, 'Indesit' cooker with four burner gas hob over and space for washing machine and dishwasher. Also with a newly installed 'Worcester' boiler. Double glazed sliding doors to rear garden, two radiators, large under stair storage cupboard and coal effect gas fire with brick mantle piece. With linen cupboard fitted with associated shelving. With built in wardrobes, double glazed window to rear and radiator below. With double glazed window to rear with radiator below. With double glazed window to rear and radiator below. With low level WC, white ceramic pedestal wash hand basin, and panelled bath with electric shower over. Obscured double glazed window and radiator. Suite comprising walk-in shower, low level WC and white ceramic wash hand basin. Also with double glazed Velux window, heated towel rail and door to eaves storage. Initially paved with steps to area laid with chippings, bordered with various plants and shrubs. With outside socket and enclosed entirely with timber fencing.